Your real estate website is launched and running, you have put the full range of SEO and social marketing strategies to work promoting it…. now it’s time to track your website traffic to discover how effective your marketing efforts really are. The importance of tracking your real estate website cannot be overstated; by examining the behavior of visitors to your website, you can gain valuable marketing insights. Once you know all the details of your visitors’ interactions with your real estate website – how they reached your website, what they did once they were on your site, and when and where they departed it – you can adjust your real estate marketing strategies to make them more effective. While there is an enormous amount of data you can get from various website analytics programs to gauge the effectiveness of your real estate marketing efforts, we’re going to focus on the 5 key analytics every realtor should track. You can get much of this information from the free version of Google Analytics, although the search engine reserves some of its information for paid subscribers. How many visitors are leaving your real estate website after viewing only a single page? Landing pages are supposed to entice visitors to view the rest of your site; if you have a high bounce rate, your landing pages need a major overhaul. How many visitors are viewing your website? There are two types of website visitors: return visitors and unique views. Since real estate marketing is about building relationships, the number of repeat visitors can be an indication that you are gaining traction as a go-to source that provides relevant real estate information. A high number of unique views shows you that you are doing a good job of attracting new visitors and successfully marketing your properties online. Where is the traffic to your real estate website coming from – referrals, paid ads, or your real estate social marketing strategies? Identifying the source of your website traffic allows you to measure the effectiveness of your marketing efforts. Examine your traffic sources, segmenting them by type (direct, organic, referral) to see where to concentrate your marketing efforts and where to invest your marketing spend. Tracking the behavior of visitors to your website provides an enormous amount of valuable data. You can identify which pages are working, and which pages are not, so you can adjust your content accordingly. For example, if visitors are spending mere seconds on your blog page, they are obviously not reading your content so you need to step up your writing efforts. By tracking your visitors’ behavior on your website, you can also gain advance notice that a visitor is primed to make a home purchase or sale. 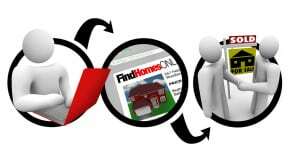 If one of your visitors is viewing a large number of pages on your real estate site, particularly in a single neighborhood or area, it is a good indication that they are getting ready to buy or sell a home. Time to drop them an email or a friendly call to set up a viewing appointment! Tracking the number of times visitors viewed each of your listings (examine the number of page views) provides you with a valuable marketing tool. If you have a listing that is lagging behind similar homes, you may need to punch up the curb appeal, retake some photos, or reword your listing copy. For listings with a large number of views but few calls, you may need to lower your asking price. You can report the number of views to your sellers so they know their home is being seen, even on a week when there are no showings. If you need help analyzing the analytics from your real estate website, or want to upgrade your online real estate marketing strategies, For Sale Marketing is here to help. As a leading real estate marketing agency in South Florida, we can supply you with everything you need for an effective online real estate marketing strategy including a responsive real estate website design with lead generating forms, dynamic SEO content creation services, detailed marketing analytics, and more. Contact us at For Sale Marketing today at 954-779-2801 for more real estate marketing tips along with complete real estate marketing services to ensure your marketing strategies are effective!